SOURCE: Safeway Safety Step, LLC. CINCINNATI, OH--(Marketwire - Feb 8, 2012) - When it comes to improving bathtub accessibility, the conventional method of a major renovation can seem daunting and expensive for many consumers. Safeway Safety Step, a manufacturer of bathtub accessibility products, is focused on educating senior citizens, people with disabilities and caregivers that, in many cases, conventional methods are extreme and no longer necessary. With the company's innovative products, the Safeway Step® and the Safeway Tub Door®, consumers can eliminate a costly and inconvenient construction project while delivering greater and safer bathtub accessibility in only a few hours. Safeway's products include the Safeway Step®, a patented product that converts an existing bathtub into a permanent walk-in shower, providing seniors and people with disabilities easier and safer access to a shower. 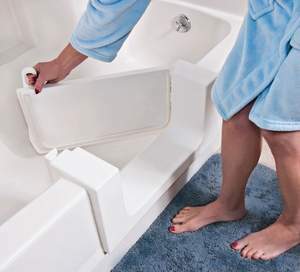 The Safeway Tub Door® adds a water‐tight sealable door to an existing bathtub for easier access. Installation includes cutting and removing a section of the existing tub and custom fitting the resulting opening with a door unit. This solution offers caregivers and multi-generational homes with improved access to the bathtub while maintaining the full functionality of the tub. "Many seniors, disabled and their caregivers simply don't know where to begin to shop for accessibility solutions for the bathroom, so oftentimes what initially comes to mind and what is often sold to them is a major remodeling project," said Chris Stafford, president of Safeway Safety Step, LLC. "The truth is, they don't need to rip out the bathtub, and there is a better, faster more cost-effective way to improve accessibility for themselves and their loved ones. With our innovative solutions, we want to change the way people think about improving bathroom accessibility, as well as the mindset of the remodeling industry that too often focuses on selling complex changes." Safeway's patented accessibility modifications are installed in just a few hours and help reduce the possibility of dangerous falls. They have been installed in thousands of homes, assisted living facilities, senior living residences, and hospitality properties, and as part of state and local social programs throughout the United States and abroad. Stafford added, "As part of our consumer education, we have recently launched a nationwide advertising campaign that is airing on major television networks across the country. We want people to know that shopping for bathtub accessibility solutions or aging-in-place products doesn't have to be intimidating or expensive. Our customers save days and thousands of dollars by installing one of our products compared to tearing out and removing the existing bathtub to install a walk-in shower or bath." Based in Cincinnati, Ohio, Safeway Safety Step, LLC is the manufacturer and distributor of the Safeway line of bathtub accessibility products. The company's products include the patented Safeway Step® and the Safeway Tub Door®, which provide seniors, people with disabilities and mobility challenged individuals with affordable and safe solutions to improve bathtub accessibility and reduce the possibility of falls. Safeway Safety Step is supported by a national network of professional installers who can transform an existing tub in as little as two to four hours. For additional information, please contact Safeway Safety Step, LLC at (877) 882‐7837 or visit http://www.safewaystep.com. About this company Safeway Safety Step, LLC. The Safeway Tub Door provides an economical renovation option for individuals and facilities interested in easier access into the bathtub area. It can be installed in most types of bathtubs, including fiberglass, steel and cast iron. The Safeway Step can be used to retrofit your bathtub into a walk-in shower.